Card Ace: Casino is a game that is available to download on the iPhone, iPod touch and the iPad for free. The Card Ace: Casino application allows you to play blackjack, slots, Texas Hold ’em poker and word ace from any location. All of the casino games featured can be played privately or against other players throughout the country. Once you download the app, you get a select number of chips that can be used on all of the casino games. There are also daily spins that will give you the chance to win up to 1 million chips. If you happen to run out of chips and do not want to wait for the spin the next day, you can also purchase more chips through the app. 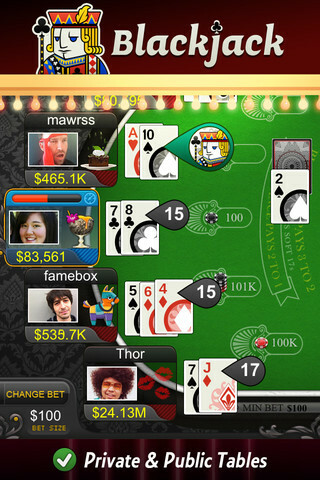 There is not much to review in the controls department for a casino app, but Card Ace: Casino works perfectly. 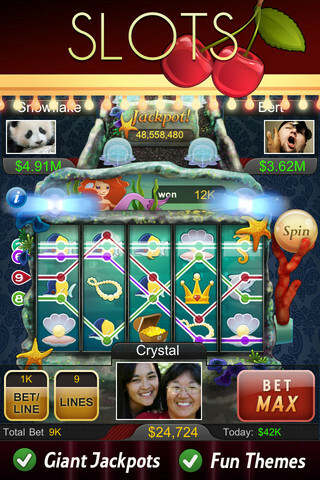 When you are playing the casino games, there will be buttons on the screen that let you achieve the appropriate action. Betting and folding are easily done when playing Texas Hold ’em, and same thing can be said about the blackjack table. If you have ever played poker or any other casino game on the computer, then the experience is almost the same on this iPhone app. Instead of using the mouse to choose your play, you touch a certain portion of the iPhone. The audio found in Card Ace: Casino is done very well. The slot machines sound real and authentic, and you can hear the chips hit table every time someone bets in poker or blackjack. These subtle touches allow you to forget that you are playing an iPhone app and draws you into thinking that you are actually playing these games in the casino. This authentic feel is what will make you keep coming back to play Card Ace: Casino for a very long time after you download it. The graphics in Card Ace: Casino are also very well done. The backgrounds and tables are very bright and colorful. When you are playing one of the games against other people, their picture is display in their seat. This is a nice touch that also allows you to forget that you are playing a smart phone application . All of the tables and backgrounds can be customized so that you always get the look that you prefer. When you are getting four different casino games for free, then Card Ace: Casino is a very great value. The developer, Self Aware Games has done a great job of putting this app together. If you enjoy playing poker, blackjack or slots, then you must download Card Ace: Casino. AppSafari review of Card Ace: Casino was written by Darius Reimm on October 7th, 2011 and categorized under App Store, Free, Games, Multiplayer, Sports. Page viewed 4528 times, 1 so far today. Need help on using these apps? Please read the Help Page.